I’ve already made my plans for Saturday. I’m going to the Inktpot. 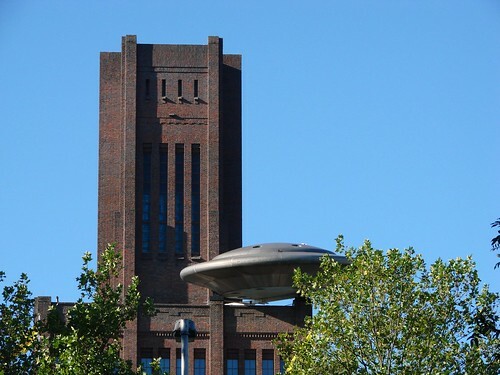 It’s the big brick building with the UFO on it. You see, this weekend, the building, which serves as the head offices for ProRail, is going to be open to the public as part of the Monument Day Relay. As a way of celebrating 25 years of Open Monument Day, a different monument will be open — throughout the country — each weekend until the official celebration in September. This weekend, it happens to be the Inktpot. The Inktpot, as it is affectionately nicknamed, was built between 1918 and 1921 and designed by railway engineer G.W. van Heukelom. The building features a contemporary design with elements of Cubism and German Expressionism. It stands 60 meters high and is the largest brick building in the Netherlands. The entire building contains approximately 22 million bricks. There’s a history of the building in one of the main halls, and the interior itself is supposed to be quite stunning, especially the view when you look up to the top of the tower. I’ve seen photos of the interior before, so I’m particularly looking forward to visiting. The building is open this Saturday, from 10:00 to 17:00, and is located at Moreelsepark 3, Utrecht. If you’re in town or nearby and interested in architecture and design, it’s probably worth a visit. This entry was posted in architecture, arts, festivals, history, news, photos and tagged architecture, de inktpot, g.w. 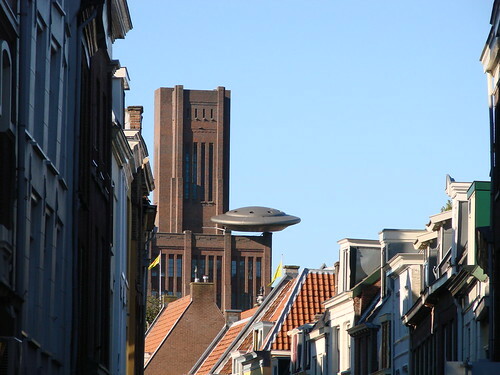 van heukelom, open monument day, open monumentdag, photos, UFO, Utrecht by Alison. Bookmark the permalink. Don’t Go! Don’t you realize the UFO is real. Aliens landed on that building and took it over. Now they are inviting unsuspecting humans inside to abduct them. Oooo! You might be right! I’d better make sure I have some Slim Whitman music with me, just in case! The exterior isn’t my favorite style, either, but from photos I’ve seen of the interior, I’m looking forward to seeing it. It’s not far from the train station.